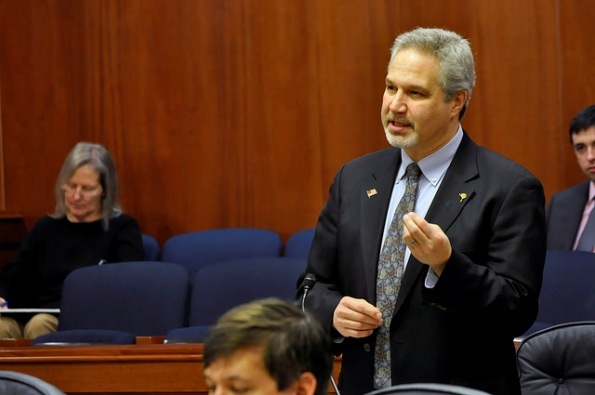 In the process of declaring “war on fetal alcohol syndrome,” a Fairbanks state senator was labeled as an enemy in the “war on women” by national media outlets for comments he made about birth control. In an interview published by the Anchorage Daily News on Friday, Republican Pete Kelly said “Birth control is for people who don’t necessarily want to act responsibly” when asked if increasing access to contraceptives could help reduce the number of fetal alcohol cases in the state. The Alaska Democratic Party seized on the remarks, and the story got picked up by outlets like MSNBC and the Huffington Post. Kelly says his response was taken out of context — he believes binge drinking is irresponsible, and that it can lead to a fetal alcohol case if birth control fails. “I don’t care if people use birth control, for goodness sakes!” says Kelly. Kelly was also criticized for bringing up the involuntary commitment of pregnant women who consume alcohol. He stresses that “Empowering Hope,” the group of lawmakers and public health advocates behind the initiative, is not currently pursuing that policy. In a speech on the Senate floor on Monday, Kelly said the group behind the fetal alcohol initiative may eventually consider the role birth control can play in reducing instances of the disorder. But right now, the initiative is built around a public relations campaign and an effort to establish community responders who can help pregnant women who struggle with drinking. One idea the group is considering is supplying bars with pregnancy tests. Kelly says it’s a form of micro-advertising. Kelly also believes the tests could catch some pregnancies early and discourage women from using alcohol. Researchers from the University of San Diego will be tracking the efficacy of the pregnancy test campaign. Last year, the Senate added an amendment establishing a woman’s health program to a bill restricting Medicaid payouts for abortions. The health program would largely be covered by federal funds, and its addition to the abortion bill was seen as an olive branch to social moderates in the Legislature. The House Finance Committee stripped that amendment in February, and Kelly told reporters shortly after that his preference was to leave the family planning program out of the bill. Kelly says the response to his birth control comments from groups like the Alaska Democratic Party are distracting from the goal of the fetal alcohol initiative. “They’re sitting on the sidelines writing press releases and talking points, and we’re actually trying to address something that is plaguing Alaskan families,” says Kelly. Kelly adds that he does not see the criticism affecting the initiative itself. Last week, the Senate unanimously passed two resolutions by Kelly expressing support for the initiative. Out of 20 senators, 19 are sponsoring one of the resolutions – urging the governor to expand substance abuse treatment programs for pregnant women and to increase screening of fetal alcohol spectrum disorder. The resolutions set the Legislature up to fund some aspects of the Empowering Hope initiative. This is the second time in one month that a Republican state senator has attracted national attention for statements made about birth control. On March 6, Fred Dyson of Eagle River spoke against a proposal to institute a government women’s health program. He argued that access to birth control is not a problem in the state because Alaska Airlines can rush-deliver it to remote areas, and he said cost should not be an obstacle to getting birth control because “four or five lattes” could cover the monthly expense.